38 projects have been honoured at the 2015 Brisbane Regional Architecture Awards announced on Friday 8th May. 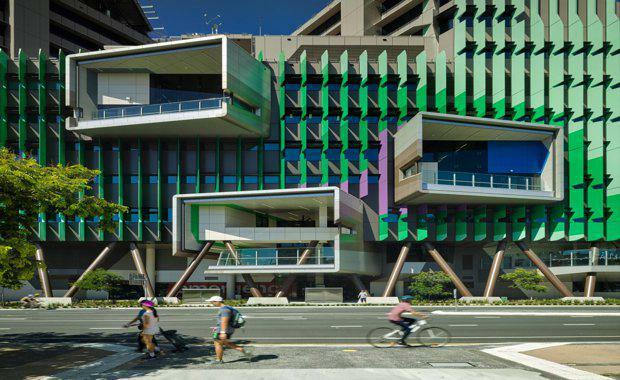 The judges handed out 45 regional commendations and two special awards including the John Dalton Award for Building of the Year and House of the Year at the event held at the Queensland University of Technology. The prestigious Building of the Year award went to Conrad Gargett Lyons' $1.5 billion Lady Cilento Children's Hospital in South Brisbane. Praising the design, the jury cited that, "Solving complex problems of urban design and architectural scale, The Lady Cilento Children's Hospital, South Brisbane establishes a new benchmark in paediatric healthcare for the State of Queensland through innovative clinical procedures housed within legible spatial and formal gestures that place the child at the centre of care." "Centred around the metaphor of a living tree with trunks/atria and branches/spaces, the internal spaces of this state of the art children's hospital achieves sensory stimulation for its patients through the use of colour, light, materials and integrated art features which distract the users from the intended functional purpose for their visit," the jury said. The Congrad Gargett team were thrilled to take home the top award with Lyons Architecture, also winning a Regional Commendation for the University of Queensland's Goddard Building Rooftop Expansion. Managing Director of Conrad Gargett Bruce Wolfe described the success of Lady Cilento Children's Hospital as a representation of seven years of intense planning, design and construction. "We are very thankful to the Institute for its recognition of Lady Cilento Children's Hospital and the hard work of Conrad Gargett Lyons on the project. "The hospital was also awarded commendations for Urban Design, Interior Design, Public Architecture and The Australian Institute of Architects Prize for Art and Architecture. The 2015 House of the Year award went to Jule House by Claire Humphreys + Kevin O'Brian Architects and was chosen by the judges for its response to the existing landscape. The jury cited, "A cave-like entry stair gives a surprising arrival up into this courtyard house, while an even more mysterious upper attic storey is hidden in plain sight. The client lives at the mid-level in cosy angular spaces that unfold into the forest floor garden and embrace the central courtyard tree." Winners of the Regional Commendations will now progress to the Queensland State Architecture Awards to be announced on 26 June. There were 11 categories in total with the full list of commendations and winners available on the 2015 Brisbane Regional Architecture Award page here.